Monetary & Fiscal Policy Research-Based Economics Lesson! I don’t know about you, but when I hear the words “fiscal and monetary policy” my eyes automatically glaze over. If my eyes are glazing and my mind is wandering, how can I expect my students to be engaged? With this frustration in mind, I designed this research-based lesson to be totally student-centered. By making the language understandable to students and giving them the ability to research the tools of fiscal and monetary policy on their own, I’ve seen incredible student engagement. Students also get to research how two presidents of their choice have used either policy (or seen it used during their presidency). 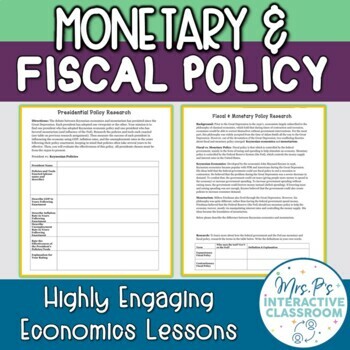 This lesson will teach your students all about the difference between Keynesian economics (fiscal policy) and monetarism (monetary policy). Then, students will research the tools used in each policy. Next, students get to research presidents who enacted or oversaw each policy type. They assess the policy’s success based on economic indicators (like GDP). I teach this lesson in one 80-minute class period.